Launched at the Southampton Boat Show, Raymarine’s latest Axiom Pro series of chartplotters features the company’s HybridTouch control, as well as multi-touch screen controls with an ergonomic keypad for ease of use in rough seas. This seems to be the trend – combining modern touch screen control with old-school knobs and buttons. It makes good sense, especially in an open boat, when touch screen control can prove ineffective. 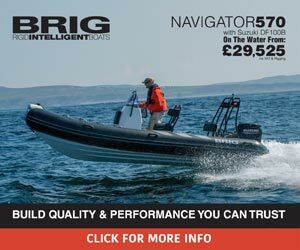 The range is offered in 9″, 12″ and 16″ display sizes, and each model is available with Raymarine’s RealVision 3D sonar, combined with an internal 1kW CHIRP sonar – so no need for an external module. This powerful offshore sonar employs a wide spectrum of CHIRP sonar frequencies and enables anglers to see through dense schools of baitfish, identify thermoclines and simultaneously target gamefish in deep water. Unlike high-frequency RealVision, which paints an incredibly detailed picture down to 300ft, multi-frequency CHIRP can record depths of 3000ft or more. Built to perform in bright sunlight, the high-definition Axiom Pro display has ‘In-Plane Switching (IPS) display technology’, maximising viewing angles and reducing blackouts when wearing polarised glasses. Powered by Raymarine’s new LightHouse 3 operating system and driven by a fast, quad-core processor, Axiom Pro is intuitive and can be easily personalised to suit individual tastes. The system’s LightHouse 3 operating system enables integration with multiple Axiom displays, CHIRP radar, Evolution autopilot and FLIR thermal night vision technology. Prices start from £2,500 (inc. VAT).